We also repair door locks, install ignitions, and copy high security keys. We keep you and your property safe and secure. 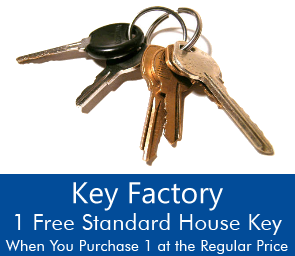 Key Factory in Milpitas, California, provides professional locksmith services for your business, home, and vehicle. Have you lost a key? Has a former employee failed to return a key? Contact us right away so that we can create a new key from a master or re-key your locks. Our fast and friendly service will help you reestablish your security. Key Factory has been in the same location for more than 34 years. And you can count on us to be here tomorrow. You’ll find that our customer service is much better than our competitors. That’s because we care about your needs and we want to continue serving you. Contact us for more information about our commercial, residential, and automotive locksmith services.